As the great Kevin McAllister once said, “This is it. Don’t get scared now.” Matty has put on one of his patented late season runs and has closed a once sizable gap to only a 2 game defeciet. Matty does have a 2 point lead in confidence points going into the final week of the season. At this point I am playing not to lose. What a terrible feeling that is! The Pats know what’s at stake here. They know that with a win and a Denver loss, the Pats can grab the top seed. They also know that if they slip up and lose, they could miss out on a first round bye. I expect Belichick to have his guys focused on the task at hand, and the Pats to win a close division game at home. If Scottie wanted to actually win at something, he could have bet me before the season that the Panthers would win the NFC South and I would have taken that ten times out of ten. Nobody saw this coming, but now it’s on Ron Rivera and Cam Newton to keep the momentum rolling and make some noise in the playoffs. I just can’t see the Ravens not being in the playoffs, and the Bengals are notorious for not showing up in big games. Joe Flacco does just enough to earn a win and get the Ravens into the playoffs, while simultaneously ensuring that the Patriots retain at least the 2 seed. Honestly, I have no confidence in either of these teams. The Titans are turnover prone under Ryan Fitzpatrick. The Texans are useless under Wade Phillips. Home team wins this one. As I’ve mentioned a couple of times over the last couple of weeks, the Colts might be the worst 10-5 team that I’ve ever seen. They somehow beat the Chiefs last week, but then again the Chiefs aren’t anything to be worried about either. I just don’t think a team with no offense balance can be successful in the NFL. Colts win this one, but there season will end shortly. Man, I hate Tannehill. All of you saw the true Ryan Tannehill last week. The terrible quarterback that I have been talking about for two years was on display last week. However, the Jets are dismal. Geno Smith is worse than Sanchez. The Jets just can’t get it right. The Lions were eliminated from playoff contention last week after a loss against the Giants. Classic Detroit. I expect Jim Schwartz to get canned after this season, so it’s only right that Detroit sends him off with a win. We all know Stafford just plays for stats anyways. Is any team in the NFL more of a mess than the Washington Redskins? Well, maybe the Cowboys but even they were able to beat the Redskins last week. I think that the Giants players know they might be playing for coach Coughlin’s job, and that matters to them, while the Redskins players are probably hoping that Shanahan gets fired. The last I heard is that the Steelers had an outside shot of making the playoffs. That’s all you need to say in that locker room. The Browns are on the right track, but nobody gets in Mike Tomlin’s way! The return of Aaron Rodgers makes this an easier selection. I think that this game is going to turn into a shootout. However, even though Aaron Rodgers has been in the Packers’ system for a long period of time, there has to be some amount of rust there. The Bears got down big to the Eagles during last week’s game, so I expect them to come out of the gate with a purpose in this game and win a spot in the NFC playoffs. The Broncos know that a win gets them the top seed in the AFC. The Raiders have no shot in this one. The Saints are nearly unbeatable at home. That’s another reason why they need to win this game and hope for a Carolina loss this weekend. The Cardinals defense is good, really good. However, Carson Palmer is still their quarterback. The 49ers have been hot lately, and will look to continue to build momentum heading into the playoffs. Meanwhile, the Cardinals will experience a let down following a big win in Seattle and miss the playoffs after winning 10 games. The Chargers know what’s at stake on Sunday, while the Chiefs are locked into the 5 seed and really have nothing to play for. Earlier this season, the Chargers beat KC 41-38 at home, and I expect a similar result in San Diego as the Chargers are battling for a playoff spot. This is actually an important game for the Seahawks. What once looked like the most dominant team in the NFC has shown some chinks in their armor after a loss last weekend against the Cardinals at home. Seattle needs this win to head into the playoffs on a positive note, and to secure a first round bye. 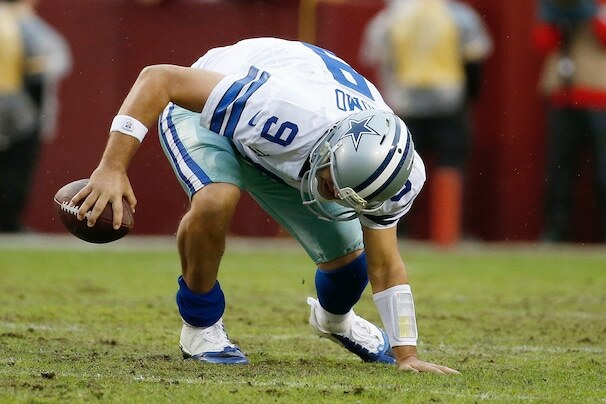 Tony Romo out hopefully means that the Cowboys will rely more on the run. With that being said, the Eagles have actually been much better against the run as of late than most people think. The Eagles have been arguably the best offensive team in the NFL since Nick Foles took over, and I expect that trend to continue against a porous Dallas defense.